In order for you to enjoy your hot cup of tea, you’ll need to have the right and suitable tea kettle. So how do you exactly know which tea kettle is best for you? Is it the price you need to consider? Or is it the brand? How do you know which one to pick? Worry no more, we’ll help you decide. Continue reading as we look at both electric and stovetop kettles and discuss their perks and differences. One of the greatest things about stovetop kettles is that they are far more affordable than the electric ones, although there are cheap electric kettles out there nothing beats the whistle that the stovetop kettle makes. The whistle of the kettle makes just you feel like relax and at home.And lastly, you wouldn’t need electricity to use a stovetop kettle which you can use when you have power outrage or while camping. Also, between t﻿﻿he stovetop and electric ﻿﻿kettle﻿s, the stovetop kettles need less cleaning compared to the electric ones, since you’ll need to be extra careful cleaning the heating element inside of it. So basically the stovetop kettles are easy to use and you can use it anywhere even without power. DID YOU KNOW? In 1923, one of the greatest thing in this world was invented, the stovetop kettle by Arthur Large. Instead of waiting for the water to boil on the stove, using the electric kettle, you can just plug it into a power outlet. Most people would say that the electric kettles are much more convenient than the stove top ones since they are specifically designed to heating water it tends to be more efficient. Also, it heats up the water quickly with less than 5 minutes compared the 10 minute boiling time of a stovetop kettle. This is also perfect for you if you are always in a hurry or too busy to wait. One of the perks of electric kettles is it has a self-timer wherein it automatically just shuts off when the temperature of the water is ready. DID YOU KNOW? 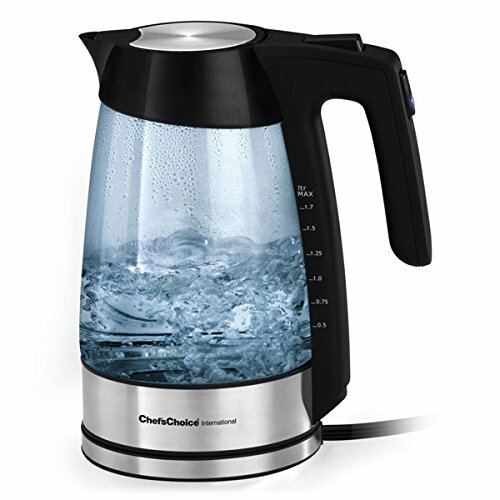 Like the stovetop kettles, electric kettles also originated from Great Britain. The very first electric kettle was made by Compton and Co in 1891.In this video, you can compare the difference of Electric and Stovetop Kettles. This is considered to be the most popular. 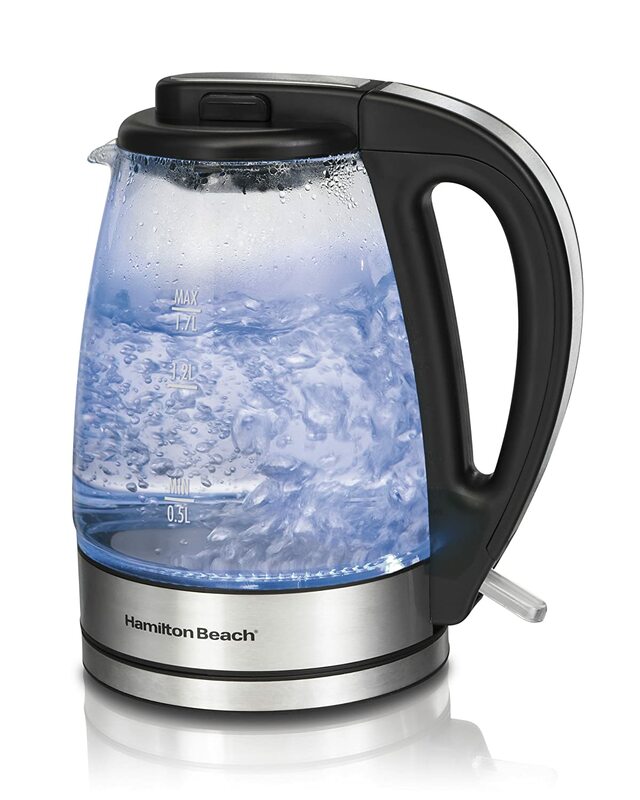 It might take a while for your water to boil when you have this type of kettle but it is actually easier to clean. They are known to be very affordable although you might want to get a pot holder as well if you will be getting this since it might burn your hands when you pick it up. If you are into what the kettle looks like rather than what it’s really made of. The glass kettles are suitable for your taste. It is also easy to clean and wipe. This is the type that you want to show off to your guest when you’re having a tea party. Although, since it is glass, this type is the most fragile of all so it cannot really sit on the heat for long. Aluminum kettles are a little more pricey than the first two but very efficient. 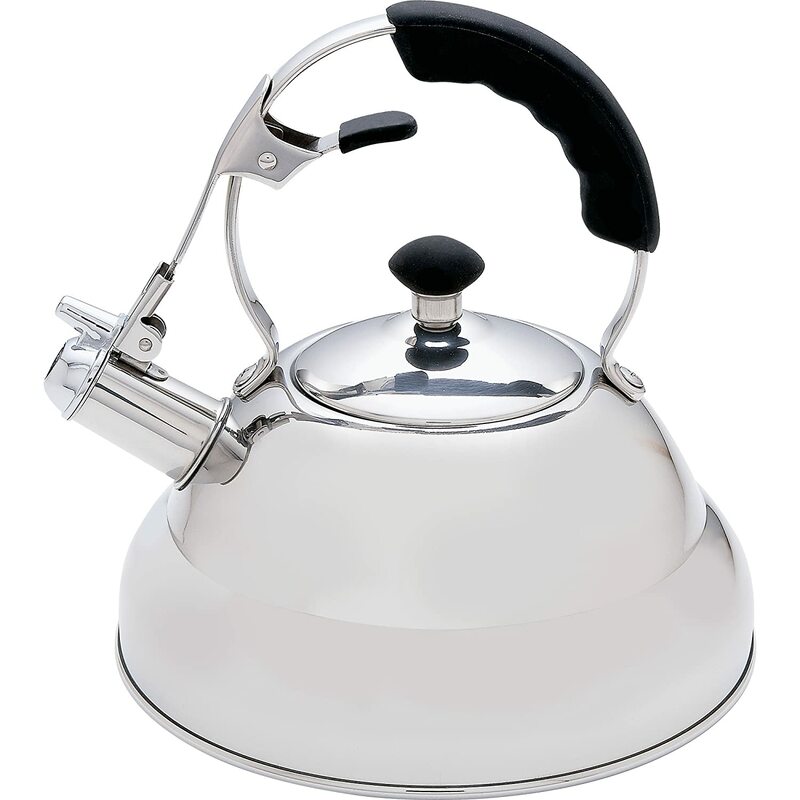 These type of kettles are highly resistant to stains and scratches. It is also very lightweight and is perfect for camping trips. They also usually last a long time so I guess being expensive is okay. However, there are some health precautions needed when using aluminum in your kitchen because it can be harmful to your health. The copper type of kettles conduct heat better than the stainless ones but you should always use them on medium heat because the water tends to boil rather quickly. This type of kettle requires maintenance to keep it from tarnishing and requires cleaning solutions to keep the copper from being scratched. The cast iron tea kettles are heavier than the previous ones but very durable and good at holding heat. It is also one of the most popular ones out there despite of it being kind of prone to rust so care is required when cleaning so that the enamel inside of it won’t get scratched. Also to prevent the rust, it must be wiped and dried after using. 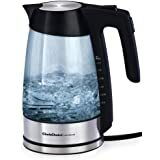 This type of kettle takes longer to boil compared to the others.Now that you know which type of kettle might work for you, here are some reviews to help you find the kettle fit for making your favorite tea. If you are looking for an extremely good-looking tea kettle that would make you want to throw an Alice in Wonderland tea party, this kettle is the right one for you. It is perfectly polished with its beautiful mirror finish that would make your relatives want to have one when they see it. It also looks great on any kitchen décor with its black rubber coated handle that goes so well with the steel kettle. It has a riveted handle that would protect your fingers from being burnt. The handle is slightly in the way for filling as it cannot be hinged due to the style. When it comes to fresh hot tea that would make you want to relax at home, this tea kettle is just for you. 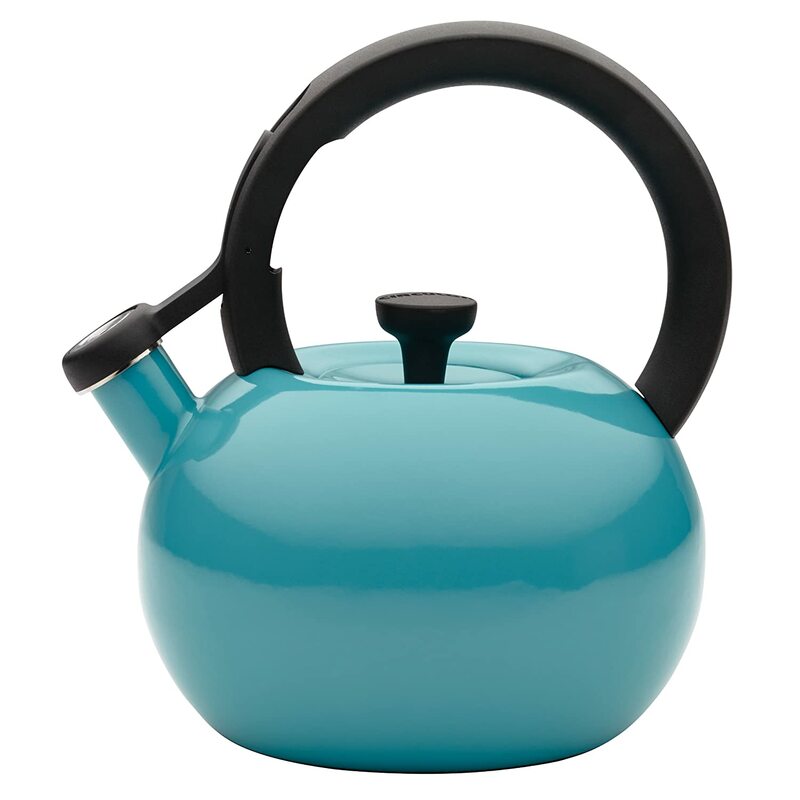 This kettle not only looks great but it also easy to use because it is light-weight. It is a durable stainless steel, with beautiful thin pout that would make it easy for you to pour. With its generous capacity of 40 ounces, it is good for about 3-5 cups. It also gives you this homey vibe whenever you use it. 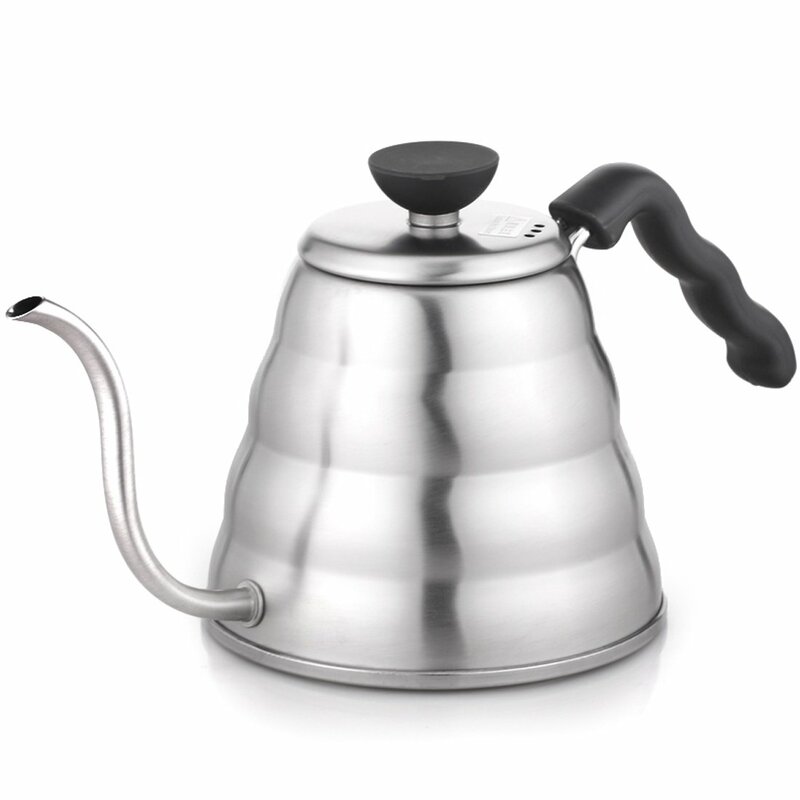 This kettle allows you to pour water over the coffee smoothly and at a consistent and precise pace. This tea kettle is suited for you if you are looking for nicely retro kitchen tools with its strong in vogue tea pot handle with one-touch gush lever for simple and agreeable operation. One thing that I absolutely love about this kettle is that it comes in various colors to choose from like Turquoise and Kiwi. Also the handle of this kettle is separated from the heat so you don’t have to worry about your hands getting burned. The variety of colors is nice but it doesn’t keep the kettle from rusting. 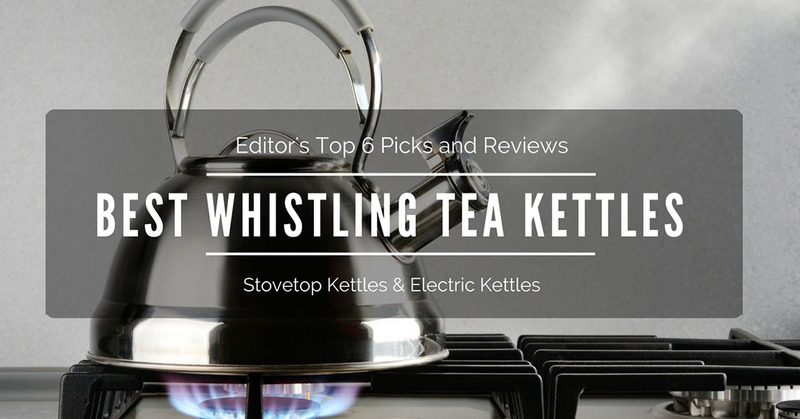 But if you would rather have electric kettles, here are some of our top pick reviews that would help you out in finding the right kettle. It has a removable filter in its spout which is a handy feature. The handle is wide, non-slip and comfortable. Not quite impact and a little heavy. Can be a little loud and slightly taller than a usual electric kettle. If you want an inexpensive but impressive glass kettle, this one is for you. The kettle itself is lightweight and with a comfortable handle which makes it easy to lift even if it is full. Also, the entire perimeter of the kettle’s floor beautifully lights up in a bright blue color. What I like about this product is its wide opening for easy cleaning. Unfortunately, the lid has 2 side buttons which have to be pushed in to open so there is a sufficient seal if you leave the top closed otherwise, one edge stayed slightly ajar and the kettle boiled continuously without shutting off. With 1500 watts of power, the kettle can boil water faster than a microwave. The base rotates 360 degrees and is compact enough for tight spaces. Can also boil several liquids such as coffee and soup. Had to press firmly on the side for the lid to close. The auto shut off feature does not always turn off rather quickly. The pinch-grip mechanism on the lid puts our hand rather too close to hot steam. Another cordless electric glass kettle is more petite and compact than the previous ones. 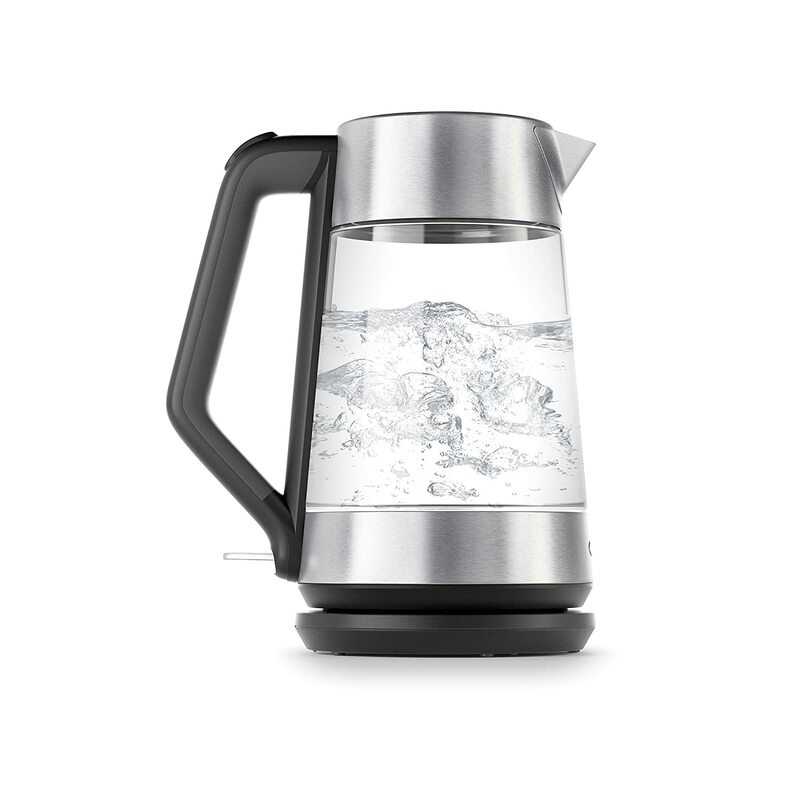 The see-through jug style model takes the guesswork out of finding out how much water’s in the kettle or whether or not it has actually come to a boil. What I like about this kettle is that because of that see-through glass, I can tell the water level and the progress of water boiling. But then when the kettle has too much water and it reaches its maximum level, some drops of hot water splatters from its spout as it boiled. Yikes! Not to safe when it’s filled at its point. This kettle is easy to use. The button that opens the lid can be easily pressed with the same hand that is used to hold the handle. A “beep” alerts you when the water is boiling. It is petite and lightweight which makes it comfortable to lift and pour. The bottom part of the insides of the kettle rusts rather quickly. Can’t reach the maximum water level limit because of the hot water splattering out once it is boiling. Out of all the tea kettles we have mentioned above. It is quite obvious that if you want to keep the kettles super clean and the wonderful sound of whistling the Stovetop Kettles is the one for you. But if you are more modern and into techs then the Electric Kettles are what you should go for.But then again I cannot deny the fact that Stovetop Kettles are way more efficient in making tea. Like I have mentioned above, it is more convenient to use the stovetop kettles because you don’t need power to use it. You can bring it anywhere you go and scientists also said that the natural gas is more efficient in heat transmission than electricity.The stovetop kettles clearly got a lot more advantages. Yes, it does not really matter if you are an avid tea drinker but choosing and having a great kettle in the kitchen can bring enjoyment and satisfaction to everyone. Hope the reviews above help you make up your mind in choosing the best whistling tea kettle. Thanks for reading!